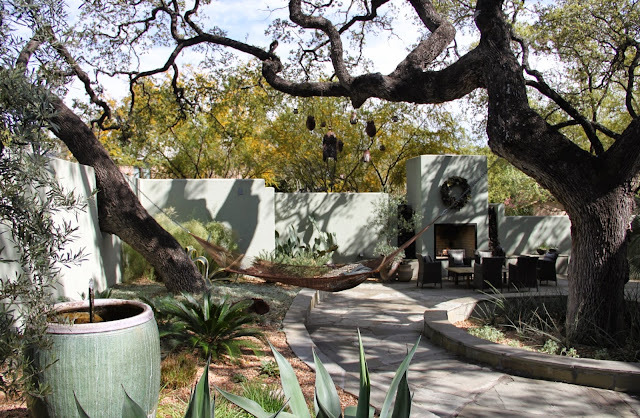 The Garden Conservancy Open Days tour returns to San Antonio on October 14th. 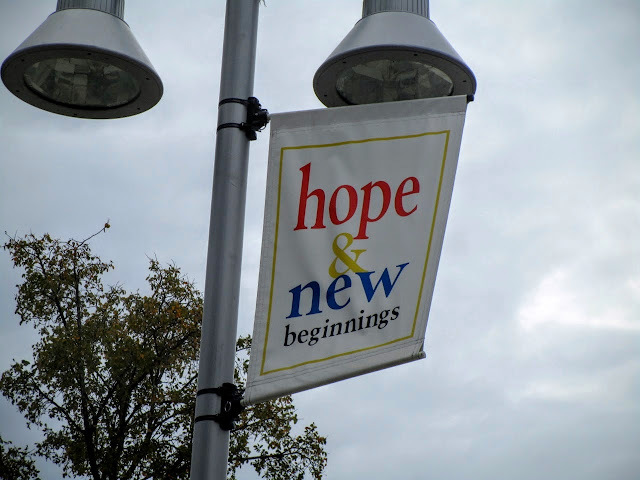 Held annually in cities around the country, most cities hold Open Days every other year. 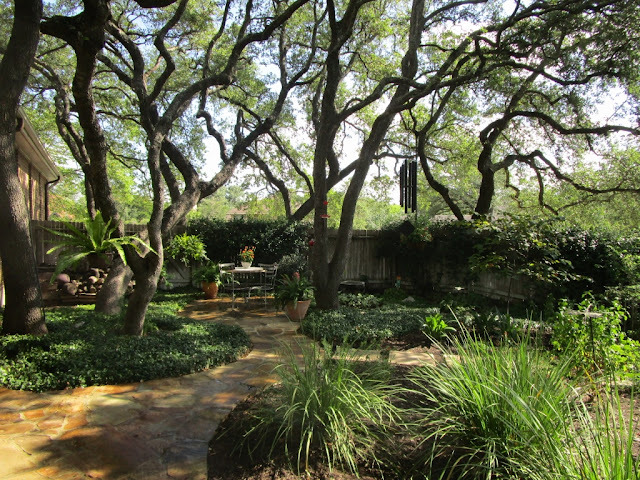 The Garden Conservancy raises funds to preserve special private gardens such as Peckerwood Garden in Hempstead, Texas. In San Antonio we have missed a few years and it was time to bring Open Days back. 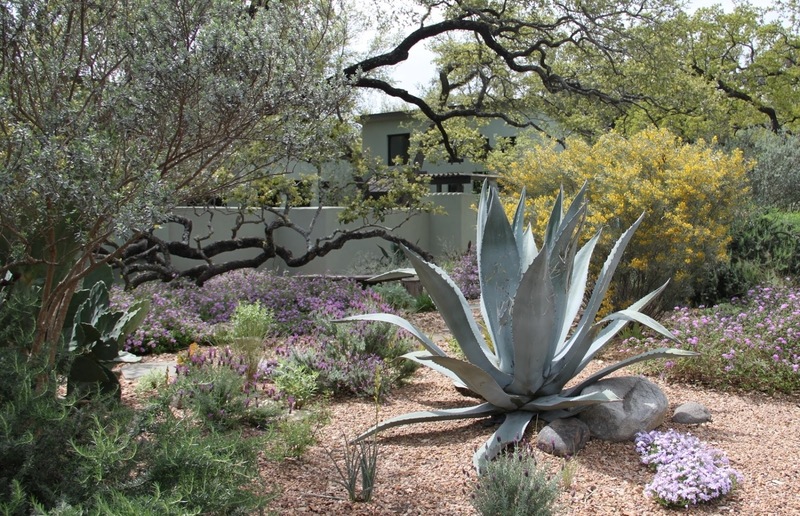 This year Gardening Volunteers of South Texas partnered with the Garden Conservancy to present six outstanding San Antonio gardens. A full year of planning behind us, the countdown begins for real with just two months to go. You can read detailed information about each garden on the website so I'll present this preview with some of my own observations. First, the Peterson's self-designed garden in Colonies North was a huge hit on the Watersaver Landscape Tour three years ago and a clear choice by the committee. Elegant, relaxing and inviting it's always a pleasure to visit this garden. Also featured on Central Texas Gardener and on SAWS website GardenstyleSA. Even if you toured this garden before, you'll want to see it again to view the updates, and for those who missed it the first time, here's your chance. The Gilliam's Terrell Hills home looks as if it has been here for decades even though it was just completed in 2016. 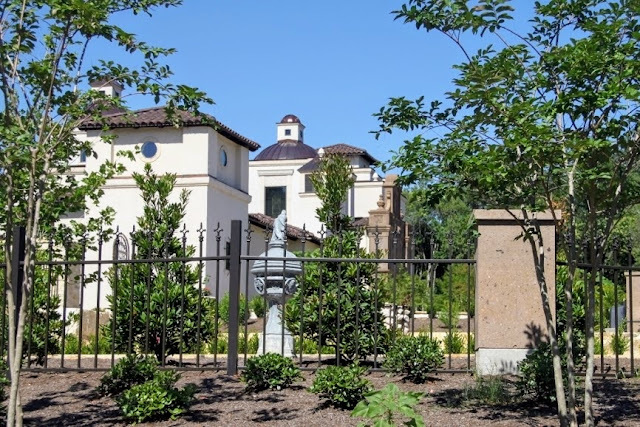 With architecture based on the Spanish Colonial style of our historic San Antonio Missions it's a beautiful setting for formal gardens surrounding the house. The Gilliams have lived and traveled in many parts of the world so they looked to their travels and relied on a design by John Troy, ASLA, to pull their collection of garden objects and ideas together on a triangular shaped lot. Even though the garden is newly planted, we thought the house and garden special enough to include on the tour. 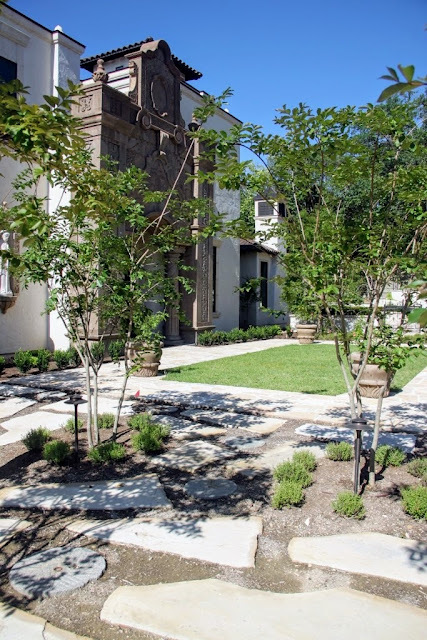 The spectacular front door surround was inspired by historic buildings in downtown San Antonio and faces a formal courtyard. A brick labyrinth is just one special feature of the front garden. 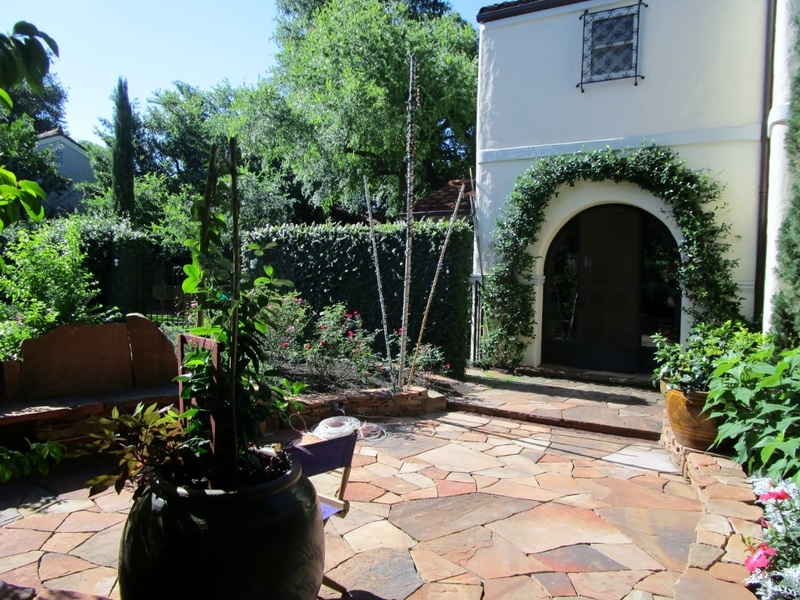 The back garden, with stone walls inspired by at the Alamo, is all about family with a fun ivy-covered troll and Cinderella mosaic to delight grandchildren. Below the garden wall sports a fountain inside a half-round opening. Also in Terrell Hills is the Fisher's garden designed by Austin based garden designer and writer Scott Ogden. 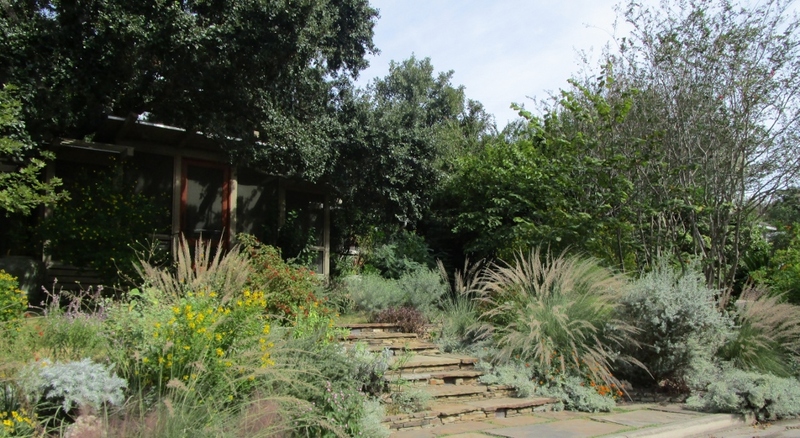 Texas native plants, especially grasses, take front and center in this small garden. The sunny front slope contrasts with a shady back garden which features a large flagstone patio. Next up is the Ware's estate garden in Hill Country Village. The Wares have also lived and traveled extensively abroad and their garden reflects their experiences. You'll enter through gorgeous custom gates passing a wildflower meadow on your left and olive grove with table for al fresco dining on the right. Below is the European-style parterre featuring a beautiful faux bois table set. 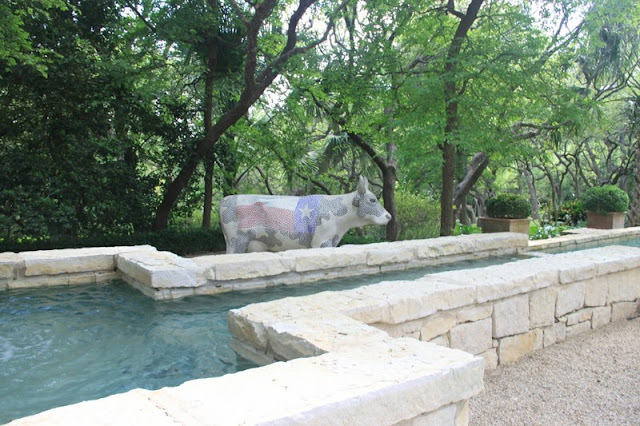 On the pool terrace you'll find "Cow Tex" from the cow parade some years ago grounding this garden firmly in the Texas Hill Country. When Bob Coopman built his house in the popular suburban neighborhood of Deerfield just over 30 years ago he spent an extra $300 to have the developer site the house to save as many trees as possible. That extra effort paid off many times over the years with these Texas Live Oaks surrounding the house. Low groundcover ensures those oaks stand out in the landscape. 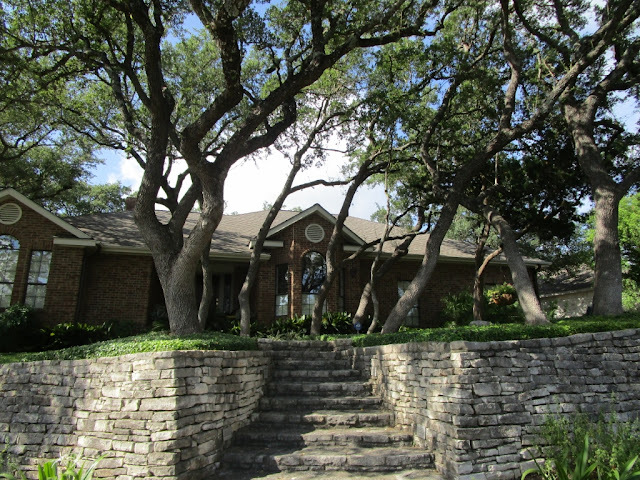 We loved the wrap-around stone wall and flagstone steps on the corner lot. Designed by Brian Hough, flagstone pathways guide us through those magnificent oaks both front and back. 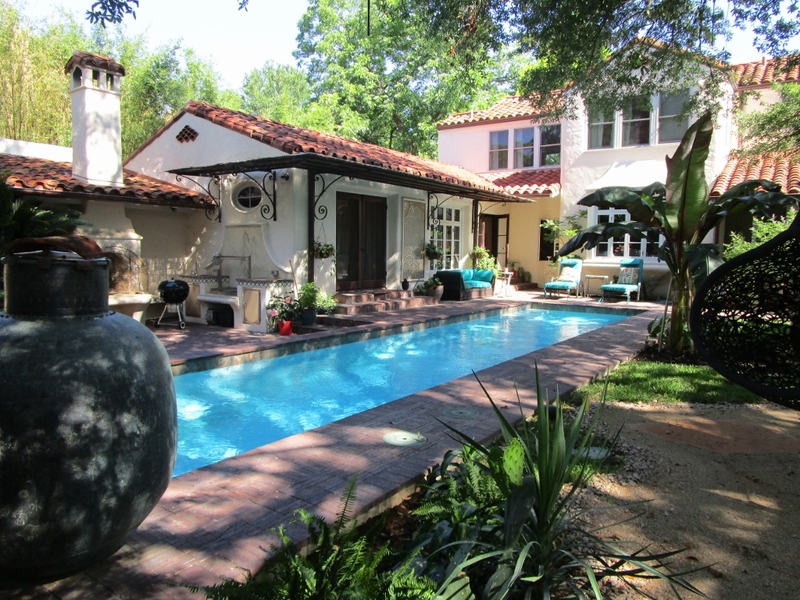 Pristinely maintained with almost no lawn, beautiful specimen plants including a mature Japanese Maple (nearly impossible to grow in San Antonio) and a variety of seating areas to enjoy it all had us wanting to move right in. It's not all green so you'll find colorful perennials accenting the green throughout and especially along the driveway. 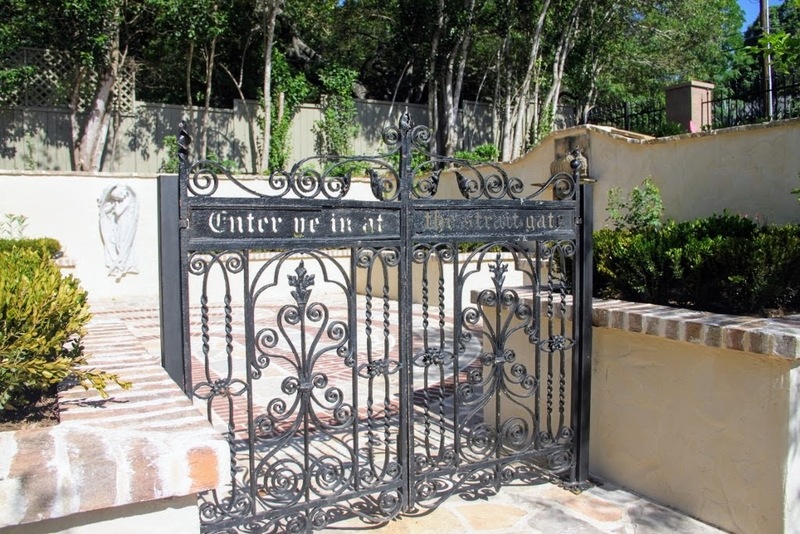 The Tupper Beinhorn home in historic Monte Vista features an artistic garden. Holly Tupper is on the board at Artpace (a contemporary arts foundation) and her wonderful style shows throughout the gardens surrounding their 1929 home built in the Spanish Colonial Revival style. Originally from New York, Holly wanted to enjoy every bit of outdoor space surrounding their home. The sunken seating area shown below is in the front garden and they found a way to bring privacy with hedges along the street while still conforming to the historic restrictions of their neighborhood. 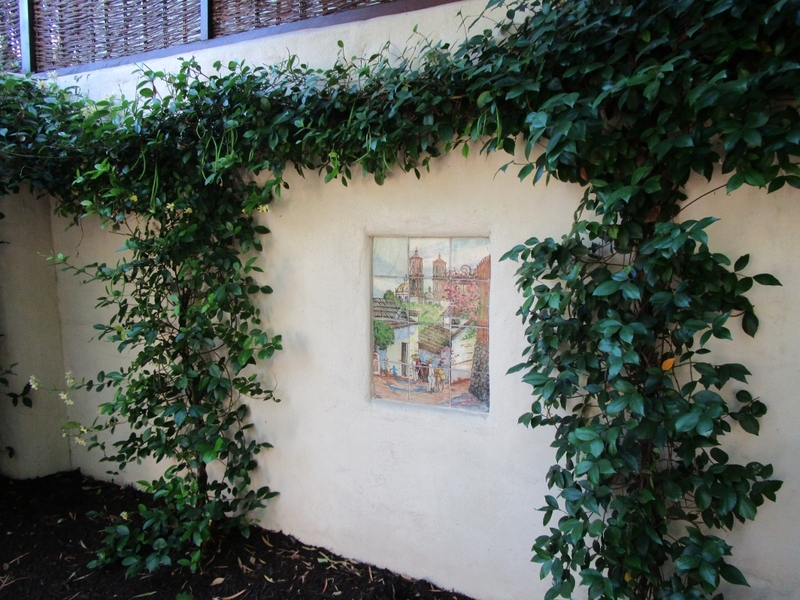 In the back garden vines surround original hand painted tile work. The wall was concrete block which they had stuccoed and wattle fencing added to the top of the wall for privacy. This resort style pool surrounded by lush tropical plantings is so inviting. Don't miss the cut-brick "rug" around the pool which is based on one Holly and husband Will Beinhorn, a native San Antonian, saw at a hotel when they lived in Singapore. The tour is set for October 14th from 10am-4pm, tickets are $36 for six gardens or $7 each and may be purchased at each home on tour day. 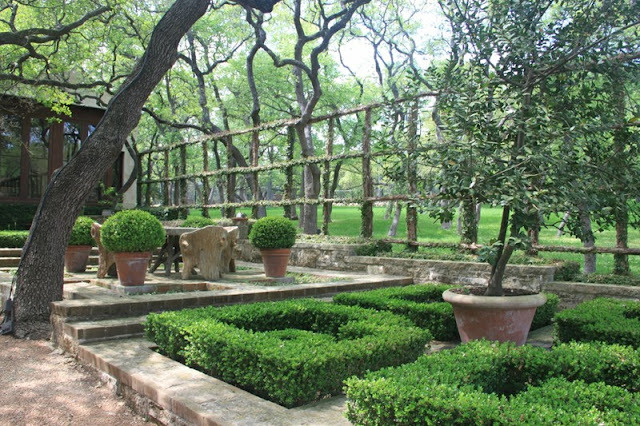 You may also purchase advance tickets and find all the addresses online at The Garden Conservancy Open Days San Antonio. 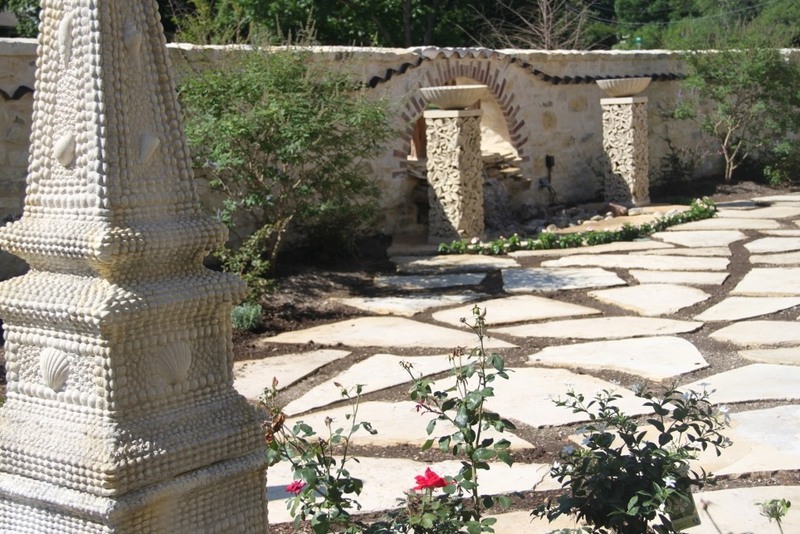 San Antonio Water System (SAWS) has also signed on to sponsor all the gardens so if you're in the bonus point program you'll get points for visiting those gardens. Be sure to look for the sign-in sheet at each garden. Thanks for the heads up. I have marked it on my calendar. We look forward to having you and other Austin folks come down for the tour. Thank you Kris, it's always that way when I see tours in other places that are just too far away. That brick labyrinth is inviting (as is the pool ;-) )! I wish I lived closer--then I would be able to attend and meet you. Will you be attending the Fling in Austin next year? I'm planning to be there. Have to make sure to sign up on time I'm sure it will be popular. That San Antonio look is so distinctive. We like to think so and tried to show that off in these gardens selected for the tour.